For most of us Disney is going to be a once in a lifetime trip. 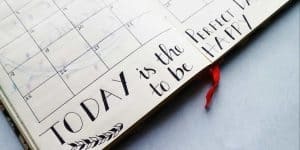 To make sure you have the best time you want to make sure that you have some key dates marked on your calendar. 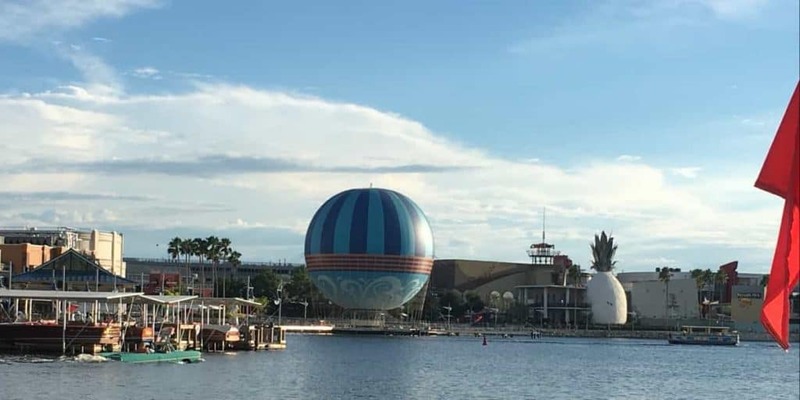 I’ve covered how to save for your Disney trip in this post, once you have the savings plan started up the next step is to get planning. These important Disney dates shouldn’t be ignored. 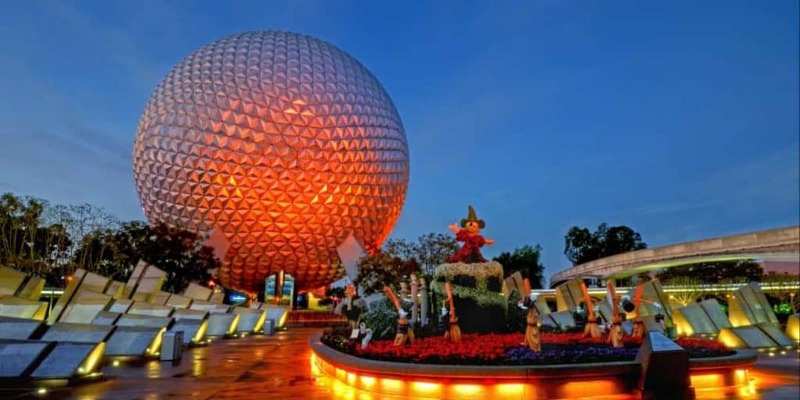 How Much Does a Trip to Disney World Cost? 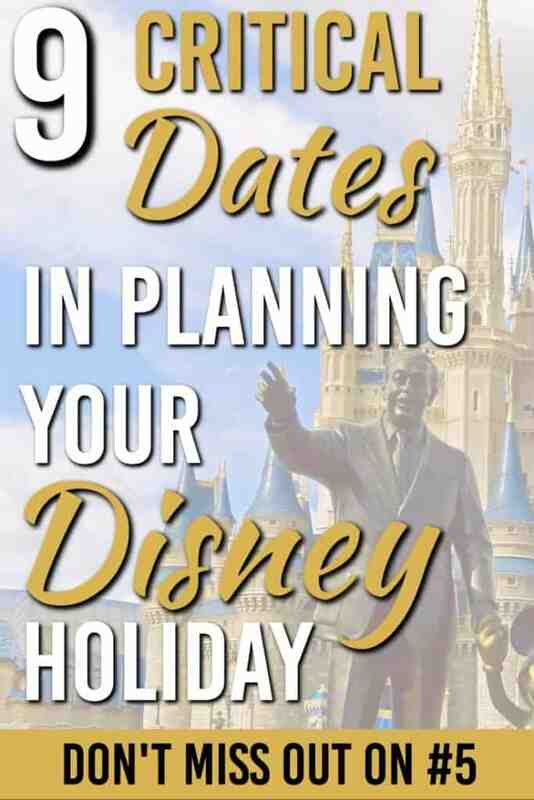 They key to a great Disney trip is to do some planning before you leave. There are certain key dates for your Disney trip that you will want to make sure you take note of. Here they are in order. Important Planning Date #6: 14 days book your picture pass Memory Maker. Start reading up on all things Magic Kingdom and other parks. With 4 parks, there are a lot of places to see, rides to ride, and restaurants to eat at. The sooner you start planning the better. You will have 185 days to start making your restaurant short list for table service. Character meals book up really quickly and you want to make sure you book them when you get to the 180 day mark (more on that in a second). Start checking around for park ticket prices, they will change over time in the next year. It’s a good idea to keep your eye on them starting now. When you know how many days you are going to Disney you can look for deals to book your park tickets. I’ve been told that Disney is pretty good at honoring their sales prices. So if you bought early and there is a sale on, they will adjust the price. This is only if you buy directly through Walt Disney and not another site. Action Step: Start researching all things Disney and start a file on what you want to see, and do when you are there. 190 Days before your arrive in Walt Disney World. At this point you will want to know which parks you are going to on which dates. Start looking at different restaurants and come up with your short list. It’s also a good idea to have your list of character meals ready. 185 days before: Book your hotel. Whether you use a Disney authorized representative, or do it yourself. You will want to have all of your accommodations taken care of earlier than your usual trip. I did it through Disney but there are many others that do it on their own. Action Step: Create a short list of restaurants and which parks you plan on visiting on which days. Get your accommodations sorted out. Note I didn’t say 6 months before, or 26 weeks, or 13 fortnights. Because it’s not. It’s 180 days from the day you arrive. This 180 days is from the day you arrive at a Walt Disney resort. So if you are getting into a resort on a Monday night, and you want to book Tuesday, you can do so 180 days from the Monday night. This is really your first important date. It’s when you can start to book your table meals for Disney World. You don’t have to keep going in every day and booking new meals. It is based on the day you arrive at the resort so you can book all of the days of your stay at once. This is also the first day you can book the Bipitty Bopitty Boutique so if you have a little princess who wants to get done up like a fairy tale you can book this starting today. Side note on the boutique: we booked before the park opened in the morning and it’s super cool to be in the park when there is barely anyone there! Action Step: Book your table service meals 180 days from the day you arrive at the park. You have the next 120 days to read up on the rides you want to book for each day of your stay in. Start planning around which rides are must-see and which ones are a pass or a maybe. Action Step: Come up with a your short list of rides you want to go on. This the first day you can start booking your fast passes (assuming you are staying at a Disney resort). You should have a list ready of which rides you want to go in and for which parks. If you are short on time it is super useful. I highly recommend it. Action Step: Book your fast passes. If you are wanting to get your Disney photos done at all the stops it’s best to book now. Otherwise you will be paying more at the end. You can get them up to 7 days before, but we are planners, so we don’t leave things to the last minute. Everyone who we know who has booked it is happy they did. The photo pass gives you magical photos and puts on shots of Disney characters in the picture. Plus it save you time in getting other people to take photos for you while you are in the park. Start checking the weather and go through your emails with Disney. If you are staying on resort, they have a shuttle service for you from Orland International Airport. Make sure to call them and double check they have your flight information. There are lots of little details to pay attention too. Have something for rain and whatever the weather may throw at you while you are down there. Action Step: Double check all your previous plans and make sure you have maxed out your FastPasses. Also check if there are any new ones available. You can pre-order your groceries and have them delivered to your Walt Disney World resort so that they are there when you arrive. One that comes highly recommended is Garden Grocers and Goodings. This is a great way to save on your meals while you are in the hotel. We used Garden grocer and they are great to work with. Depending on your meal plan you may want to have breakfast in your hotel room to cut down on meal costs. Plus Disney works with these two companies to make sure your food is ready for you when you get there. Action Step: Book your groceries. Go through your packing lists and pack all your bags. Load up the travel entertainment and check your flights. The big day is tomorrow. You probably won’t sleep, but you need to try. You are going to need your energy going into this trip! If you are needing a good packing list here is one from UnderCoverTourist. All you have to do now is get on your flights and enjoy your planning come into reality. It’s a beautiful thing. Action Step: Pack and get a good night sleep. Tomorrow you are going to be at Disney! 10 Days after your Disney trip. Go through your photos and relieve the memories. It will already have started to feel like a dream but the memories will last a lifetime! A little bit of planning and organization can take your Disney trip to the next level. 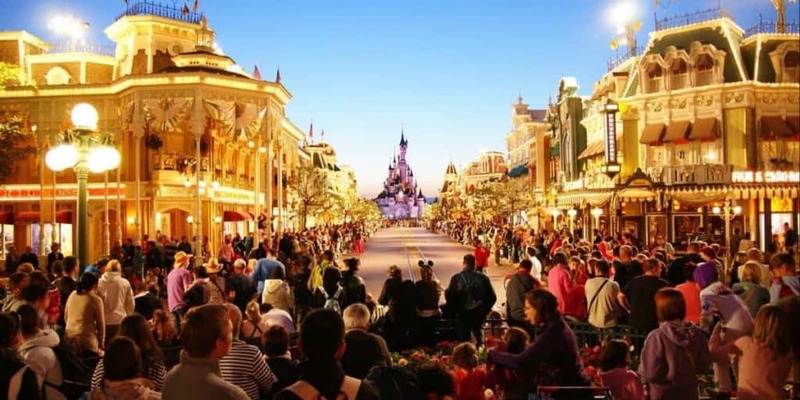 These key planning dates for Disney are a great way to get you started. 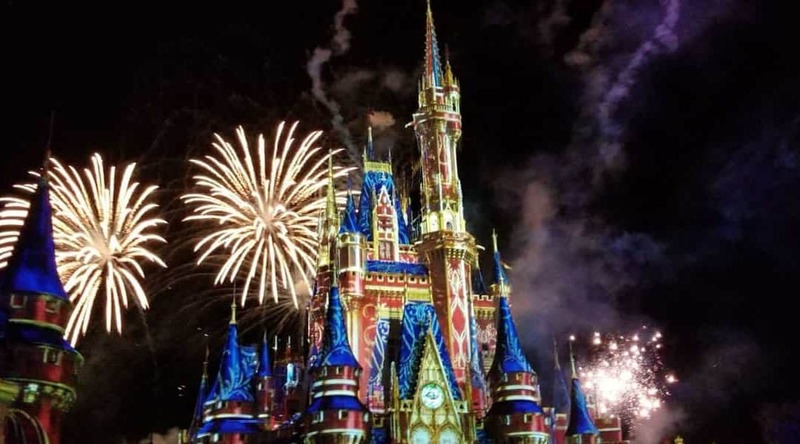 Looking for what you can do at Magic Kingdom? You can find all of the Magic Kingdom rides here! Found this useful? Share it with others! It’s important to note that as soon as you buy your park tickets, link them to your My Disney account. If you buy through Disney, they will automatically be linked, but if you buy from some place else (I get mine through Camp Pendleton Marine Corps Base, for example) you need to manually link them to your My Disney account. If you don’t, you won’t be able to make any FastPass selections.